Bethlehem Art offers olive wood art direct from Israel. Our products are hand carved and at first glance, seem to be made of dead wood. Once you combine a closer look and a little faith, you can hear our art pieces narrate the story of our faith and our Savior, Jesus Christ. The tradition of olive wood carving in the Holy Land has been handed down from father to son since the 12th century. Originally introduced by the Crusaders, the craft has been perfected by centuries of local master carvers. The carving wood comes from the olive trees that are over 700 years old, which give our products a unique beauty and quality that is not found in other wood. Browse our wide selection of products and create a beautiful art collection as a visual reminder of your faith everyday. 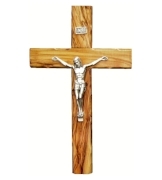 You can bring the Bible to life through many of our olive wood art collections. Whether you would like to display a scene from the beloved stories of the Old Testament or display a visual reminder of your faith in Jesus, our olive wood art is a beautiful way to integrate your faith and art. Each of our pieces is hand carved and depicts the foundations of faith. Choose from hand-carved art of Moses, the saints from the early church, the star of David and many more. Our nativity sets and Christmas ornaments are among our most popular olive wood art collections. You can choose from statues of the holy family to full nativity sets. Each of our unique designs will help you bring the Christmas story to life as you reflect on the true reason for our Christmas season. Our nativity sets and ornaments make a great decoration for your own home and great gifts for those you love. It's never too early to get into the Christmas spirit as you browse our beautiful Christmas collections. We are very proud to introduce to you the beautiful olive art of Bethlehem and to maintain the tradition of wood carving from the Holy Land. Owned and operated by one of Bethlehem's oldest Christian families, the Rishmawi family is proud to provide the finest quality olive art to bring your faith to life. The tradition of olive wood carving in the Holy Land has been handed down from father to son since the 12th century. The olive tree was chosen for more than its appearance. It has a history of religious significance with many references in the Bible. Proverbs refers to the olive and its reputed power as the “tree of life to them that grasp it, and to them that would uphold it, everyone is rendered happy.” Olive wood was also used to make the cross of Jesus Christ. God promised afterward that the olive trees would be a symbol of peace and beauty for the world. It is our pleasure to bring you the peace and beauty of faith through our fine olive wood figurines and works of art. Our hope is that your faith will thrive with our beautiful olive wood figurines.